In recent years, the Utah Department of Alcoholic Beverage Control (DABC)has become synonymous in the media with mismanagement and fraud. But under new leadership, the agency has now rankled employees with policies meant to appease auditors. First, came an effort to prevent the overstocking of inventory via a new electronic-ordering system. 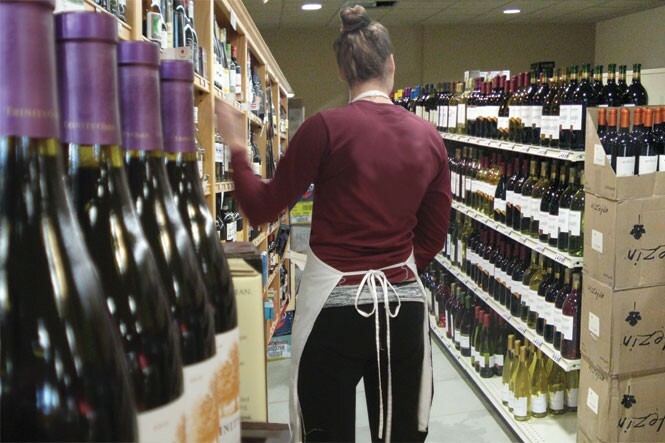 The centralized system pits human managers against machines when it comes to deciding what to stock, and when, so that customers at the state's 44 wine and liquor stores won't come up empty-handed when looking for the bottle of wine, booze or high-point beer of their choice. While the system has helped prevent overstocked inventory there have been increasing instances of shortages. When employees complained of shortages to agency leadership, their concerns fell on deaf ears. In September 2014, a new policy was enacted that has added another piledriver to the crushed morale of DABC employees. In a cost-saving measure, the agency began assigning store managers to two stores instead of one. Critics say a small pay raise for assistant managers doesn't reflect the magnitude of addional work these employees are tasked with—oftentimes, they end up acting as de facto managers. Store employees complain that attempts to talk candidly about the issue result in bullying and possible retaliation by agency leaders, whom they see as aloof and uncaring about their plight. Kerri Adams, a retired DABC human-resources manager, has been contacted by numerous current employees about what they describe as a toxic work culture in the wake of the agency's newly enacted reforms. She says that concerns over the policy have only recently come to a boil—even though it was enacted seven months ago—because the agency waited for managers to retire before redistributing their store oversight. And in recent months, with managers leaving in protest over conditions at the agency, the problem has become more acute among the already beleaguered staff. "So that means management's time is split half-and-half at each store," Adams says. "That takes out over 1,000 man-hours at each store. It then puts this horrible burden on the assistant manager, that they have to do the day-to-day managing. Most of them only earn $13 an hour, and they're taking the brunt of the managing responsibility for a large-scale retail operation." In a written response from DABC spokeswoman Vickie Ashby, the agency says those hours are made up for in new positions subordinate to the manager and assistant manager. As part of the policy, managers received a $5-per-hour pay bump for the added responsibility, and assistant managers received a $1.50-per-hour raise. Still, Adams says, assistant store managers feel they've gotten the short end of the stick. Many employees, however, are fearful of making waves expressing complaints and have already felt victimized for voicing their complaints internally. Assistant manager "X" agreed upon condition of anonymity to speak with City Weekly about problems with the new policies. X has been a DABC employee for years. However, given a perceived climate of bullying and retaliation within the DABC against employees who speak out against its policies, City Weekly agreed to protect X's identity. According to X, the division of labor is not neat nor efficient. X works under a manager who is hardly ever there, so X must remain in constant telephone contact to keep the manager apprised of store operations. Whenever a problem arises at the store—whether it's employees goofing off, or customers upset by a lack of inventory—as the assistant manager, X must shoulder much of the blame. "They consider you an enemy," X says. "More or less, anything that happens, I'm held accountable, but they don't hold managers accountable." Adams says this policy is only exacerbating the troubles the agency is having in employee turnover and in hiring new workers. She says assistant managers are not only acting as de facto operations managers, but they're also trying to keep up with the added paperwork that comes with newly enacted reforms, while at the same time trying to train new employees. The new employees, she says, cycle in and out, as a result of high turnover at the agency due to poor pay and a stressful work environment. "It's kind of like a double whammy," Adams says. The DABC acknowledges that it's a tough transition, but that it was necessary in order for stores to comply with auditors. "It has been a challenge for some store, warehouse and administrative personnel to adapt to the changes and policies resulting from audit recommendations," spokeswoman Ashby says. However, she says, "audit recommendations are meant to protect state assets. Compliance with audits is required by law." The DABC also says its early analysis shows that the new management change has been successful so far. "Store checklists indicate that performance of stores supervised by managers who accepted the challenge of running two stores are as well-run as they were in the past," the DABC's Ashby says. Adams says that it's true that the agency has to be responsive to the recommendations of auditors, but it doesn't need to go beyond the audit's recommendations. "Yes, the auditors did bring up a few problems, but the response has been so out-of-proportion that it's creating more problems," Adams says. The DABC regrets that employees may feel ignored, but Ashby points out that, in the past year, new hires have been explicitly informed that, if they feel complaints are not well received by management, they have other options—such as speaking with the agency's internal auditor who reports directly to the Alcoholic Beverage Control Commission. Still, Adams says most employees deal with immediate agency management and should be able to communicate freely with their direct superiors. Unfortunately, she says, the overblown response to audit recommendations has been made worse by the mediocre leadership tasked with implementing these reforms, who—instead of communicating the changes effectively to employees—have enacted them without input from employees or adequate notice. When employees complain, she says, they are bullied and berated openly in front of other employees and store customers. One employee she knows felt so victimized, he needed to go on medical leave and begin taking antidepressant medication. The bullying of employees "has created a culture which is making employees physically and mentally ill," Adams says.